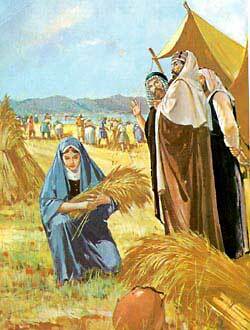 Ruth gleans for grain in the field of Boaz. IN THE DAYSwhen the Judges ruled over Israel, there was a famine in the land. And a man named Elimelech, who lived at Bethlehem-Judah, together with his wife Naomi, and his two sons, Mahlon and Chilion, left their home on account of it, and went to live in the country of the Moabites. While they were there Elimelech died, leaving Naomi and her sons, who married two women of the country, named Orpah and Ruth. In about ten years the sons died also: and then Naomi, hearing that the famine which had driven them from home had passed away, resolved to return thither with her daughters-in-law. But they had gone far before Naomi, remembering that she was now poor, as well as a widow, thought it would be better for her daughters-in-law to stay among their own people than to go with her to what was to them a strange land. So she kissed them, and bade them return to their mother’s house, praying God to bless them for their kindness to her and her sons. Her daughters wept, and refused to leave her; but she urged them to do so, till at last Orpah yielded, and, bidding Naomi a loving farewell, went back to her own home in Moab. Ruth, however, still clung to her mother-in-law; and when Naomi would have had her follow her sister-in-law, who was gone to her own people and the gods of her country (for the Moabites where heathens, and worshiped the idol Baal), she answered her, “Entreat me not to leave them, or to return from following after thee; for whither thou goest I will go, and where thou lodgest I will lodge: they people shall be my people, and thy God my God. Where thou diest will I die, and there will I be buried: naught but death shall part thee and me.” So, when Naomi saw how steadfastly Ruth loved her, she ceased urging her, and they went on together to Bethlehem-Judah. When they arrived there all the people of the place were surprised to see them, asking, “Is not this Naomi?” But Naomi, full of sorrow for her dead husband and sons, and the poverty that had now fallen upon her, answered them, “Call me not Naomi (which signifies “Pleasant”), but Mara ( that is, “Bitterness”), for the Almighty hath dealt very bitterly with me. It was the time of barley-harvest when Naomi and Ruth returned to Bethlehem; and they were so very poor that Ruth went out into the fields to glean after the reapers. One of the chief men of Bethlehem was named Boaz, a very rich man, who was a near relation to Elimelech, Naomi’s husband. Ruth happened to go and glean in a field belonging to him; and Boaz, seeing her, asked the man who was over the reapers who she was. The man answered that she was Ruth the Moabitess, who had come to Bethlehem with her mother-in-law Naomi, and that she had asked him to let her glean in the field. Boaz then spoke kindly to Ruth, and bade her not to go to any other fields to glean; and he told her, when she was thirsty, to help herself to the drink that was brought to refresh his servants. Ruth felt grateful to Boaz, and asked him how it was that he showed so much kindness to a stranger. He told her that he had heard how good a daughter she had been to Naomi; and that she had left her own father, and mother, and country, to come with her into a strange land. And he prayed that the God of Israel would bless and reward her. Then at meal-time he bade her eat and drink with the reapers. So she sat beside them; and Boaz himself set food before her. And when she returned to her gleaning, he desired the reapers to let fall some handfuls of grain on purpose for her, that she might gather the more. When Ruth went home in the evening, she gave her mother-in-law some of her own dinner, which she had kept for her; and then she beat out the barley she had gleaned. There was so large a quantity of it that Naomi asked her where she had gleaned that day. Ruth answered, in the field of Boaz. Naomi was glad when she heard this; and, telling Ruth that he was their near kinsman, she said she must contrive to see the great man again, and make him understand that the poor gleaner was nearly related to him. So Ruth did as Naomi desired her. And when Boaz knew who she was, he blessed her, and said that he would do for her all that the law of the Israelites required from him as her nearest kinsman. Then he called together the chief men of the city, and before them, as witnesses, bought back the piece of land that had belonged to Elimelech, and to which Ruth, as the widow of his son, was the next heir. After that he took Ruth for his wife; and their son Obed was the grandfather of David, who was afterward the great King of Israel.